Meet Edna, Mr. Snogglebaum, Adelaide and the cantankerous old pressman himself. 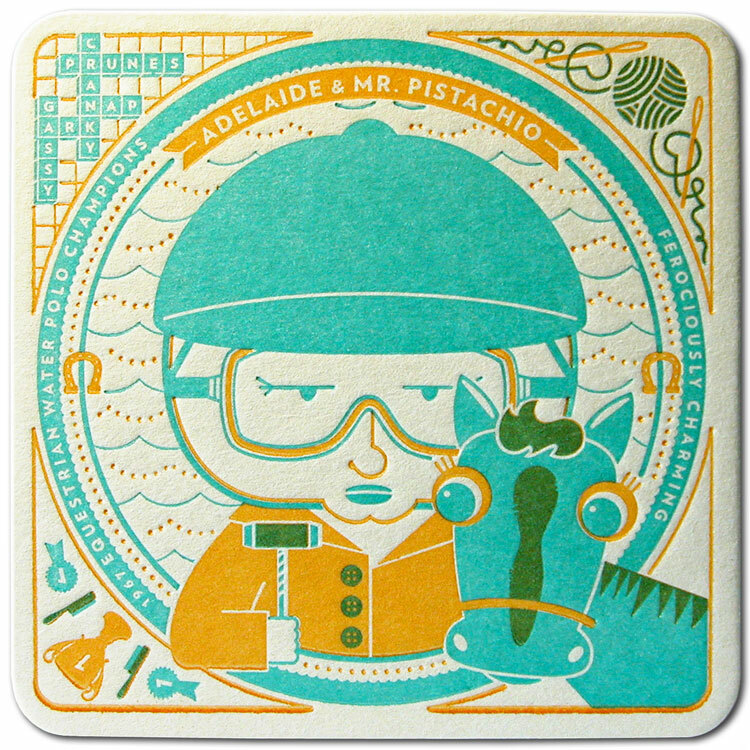 These self-promotional designs were done in collaboration with Parliament of Owls to launch our new letterpress imprintable die-cut coaster line – The Coasters. 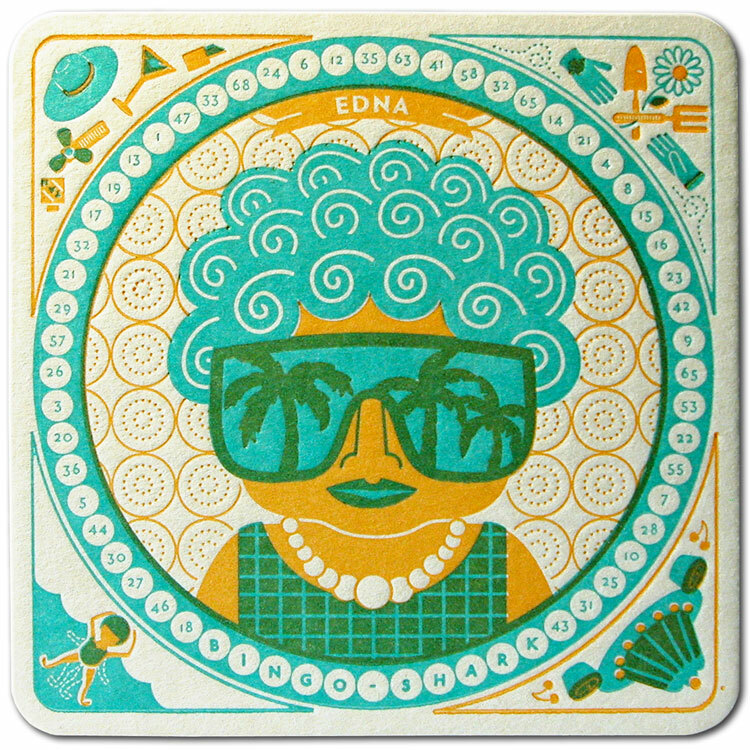 Edna likes her men young (sixty something) and her gin slow. A bit brash with a splash of class, she’s always the center of attention. Favorite Tipple: THE BINGO WING. Mix 1 shot vodka, 1 shot ginger juice, 2 shots lime juice & splash of soda. Double recipe, pour in a big glass, stir, and garnish with cocktail umbrella. Getting natty on the beach! 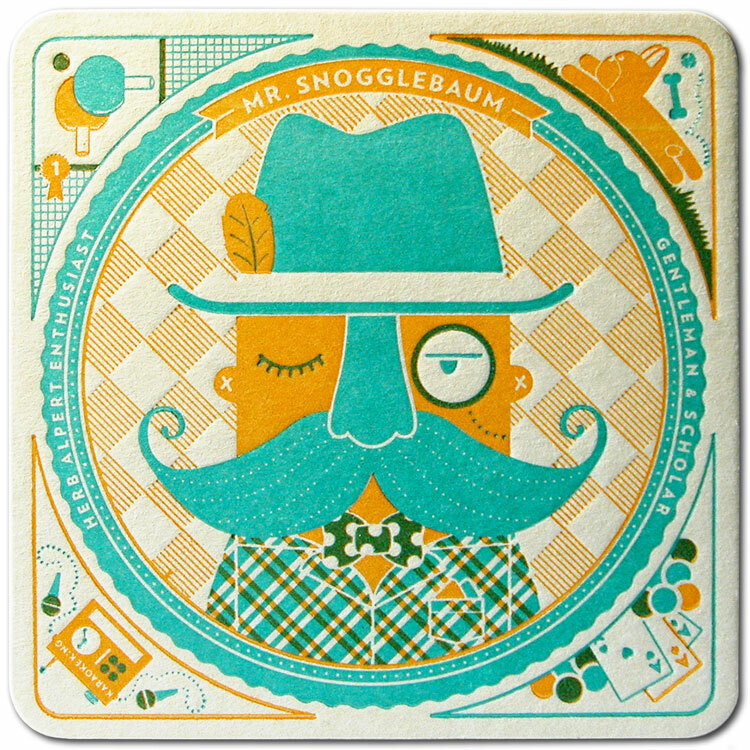 An oldie original, Mr. S has been refining his look about as long as he’s been growing his stache. The impression is unmistakable. 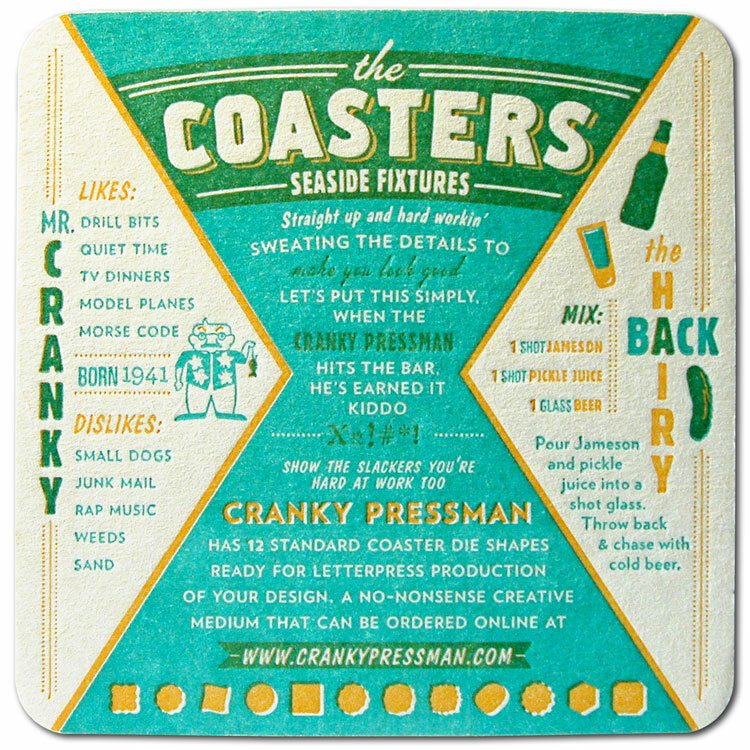 Create a coaster design to show your unique style. Favorite Aperirif: THE SHUTTLECOCK. Mix 1 part cream, 2 parts orange juice, 1 part Cointreau, 1 part Galliano. Mix and shake with ice. Strain into a chilled glass. Garnish with a lime wedge. A double shot of reality! Direct, honest and bold. To hear it straight from the horse’s mouth it’s likely coming from Adelaide not her hoofed friend. Get your brand message across directly and sharply. Favorite Punch: THE SEA BISCUIT. Mix 1 part bitters, 2 parts bourbon, 1 splash ginger ale and a splash of lime juice. Pour bourbon over ice. Add lime juice and bitters. Top with soda and shake. Straight up and hard workin’. Sweating the details to make you look good. Let’s put it this simply. When the Cranky Pressman hits the bar, he’s earned it kiddo. Show the slackers you’re hard at work too. Favorite Mixed Drink: THE HAIRY BACK. Mix 1 shot Jameson, 1 shot pickle juice, 1 glass beer. Pour Jameson and pickle juice into a shot glass. Throw back and chase with cold beer. 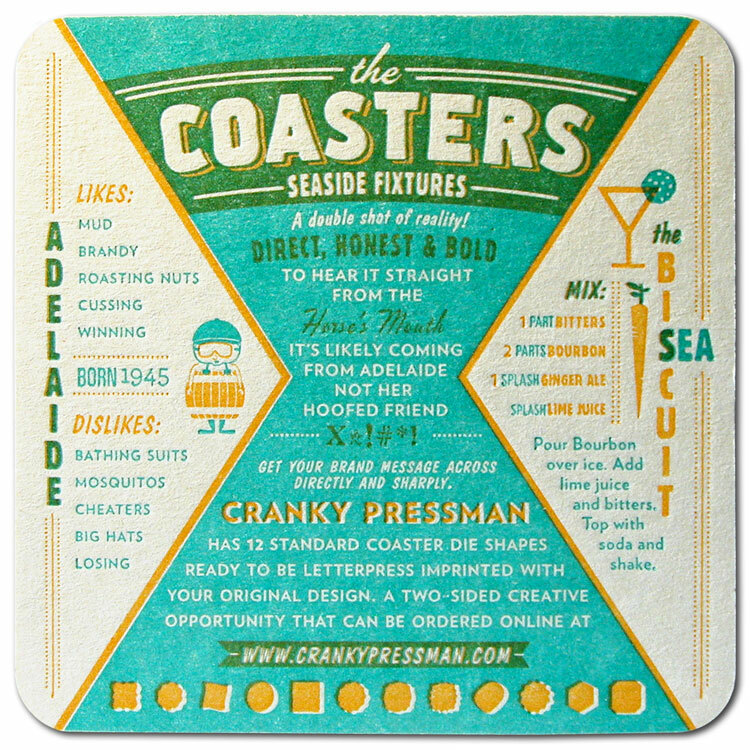 Pulp board coasters have been effectively holding highballs while simultaneously catching eyeballs with graphic brand messages. These dual purpose devices offer a unique creative medium for designers, art directors and marketers with the added benefit of proven wood protection capabilities. 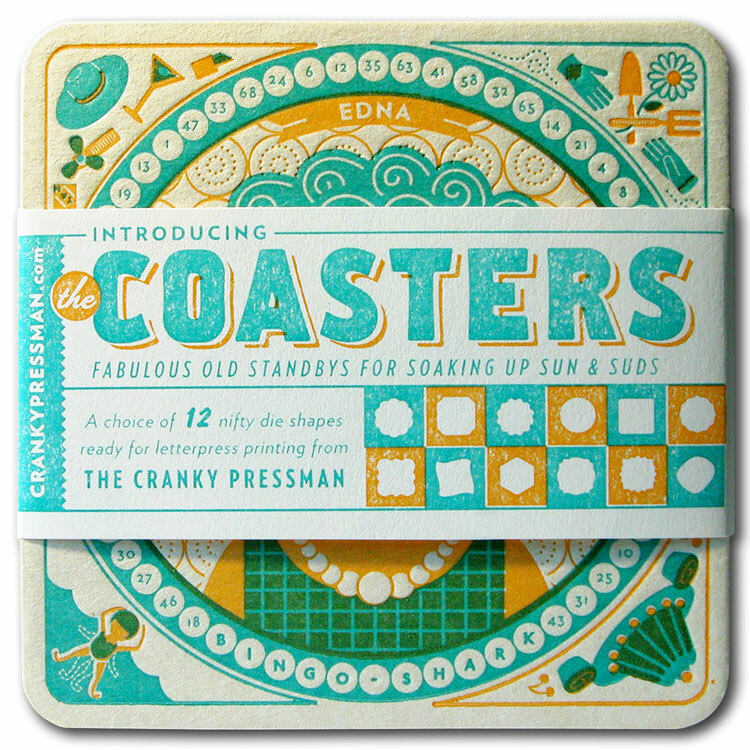 Cranky Pressman offers a line of 12 standard yet interesting die shapes to help our customers design and affordably produce their own letterpress printed coaster projects. Who better to help launch these new letterpress printables than the senior citizens of beach community living. A huge thanks to Meg Paradise, Lauren Sheldon and Ariana Dilebero. As the kids these days say, those gals are awesome! 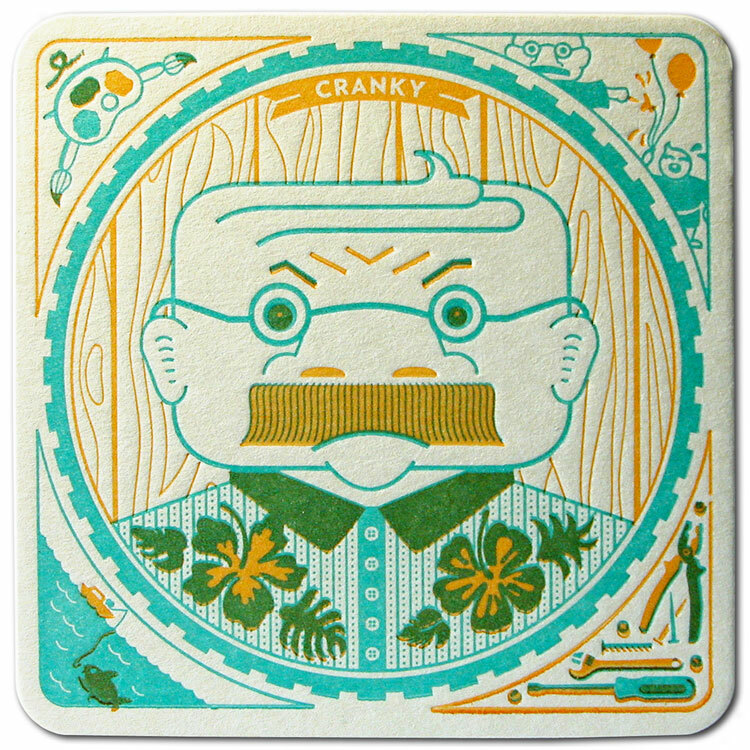 The Cranky Pressman promotional coasters were letterpress printed in two colors- Pantone 325 Green-Blue and Pantone 142 Orange on 60 point Pulp Board stock. 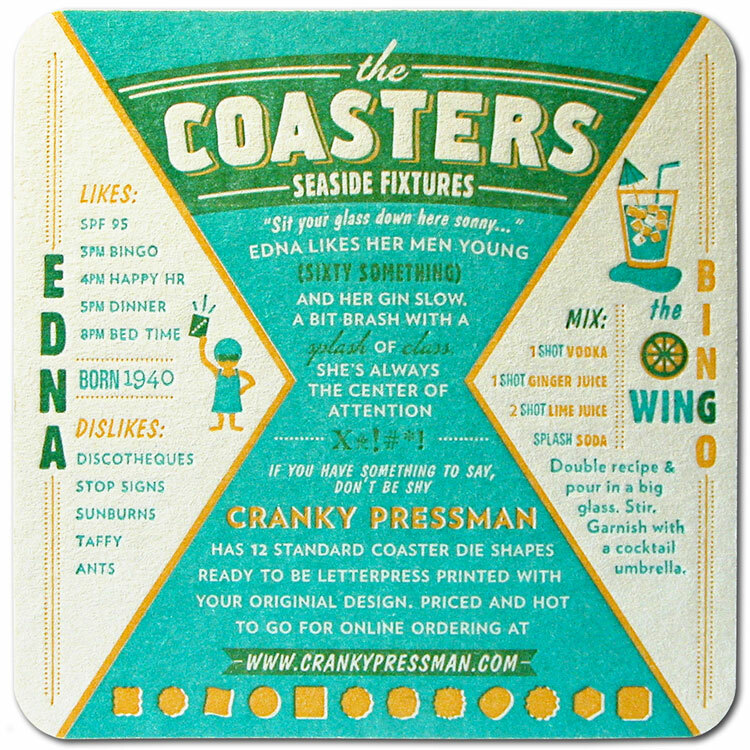 Call 330-337-3341 or email to discuss your custom letterpress coaster project. 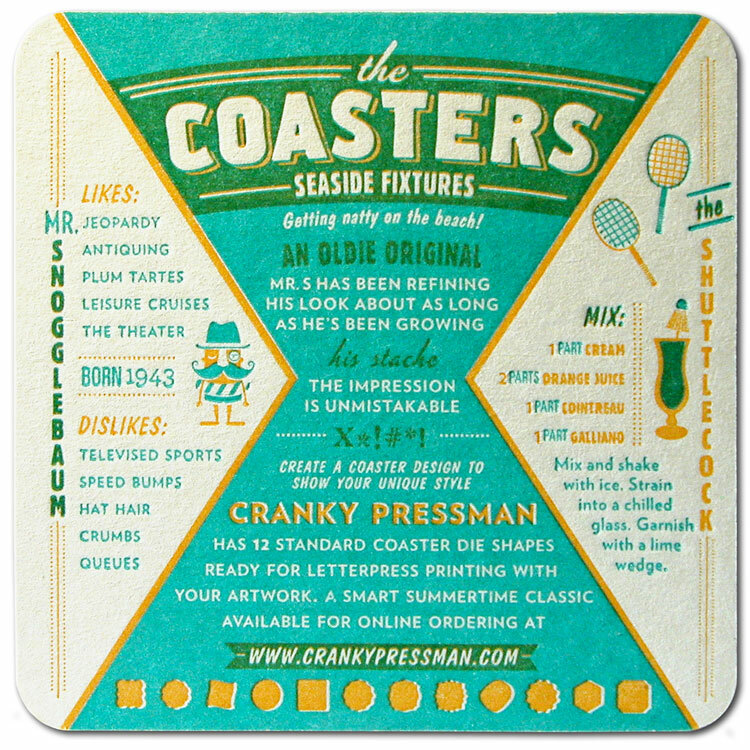 We will be reintroducing online ordering of Custom Letterpress Coaster Printing soon. In the meantime just give us a holler to go over and quote your project.